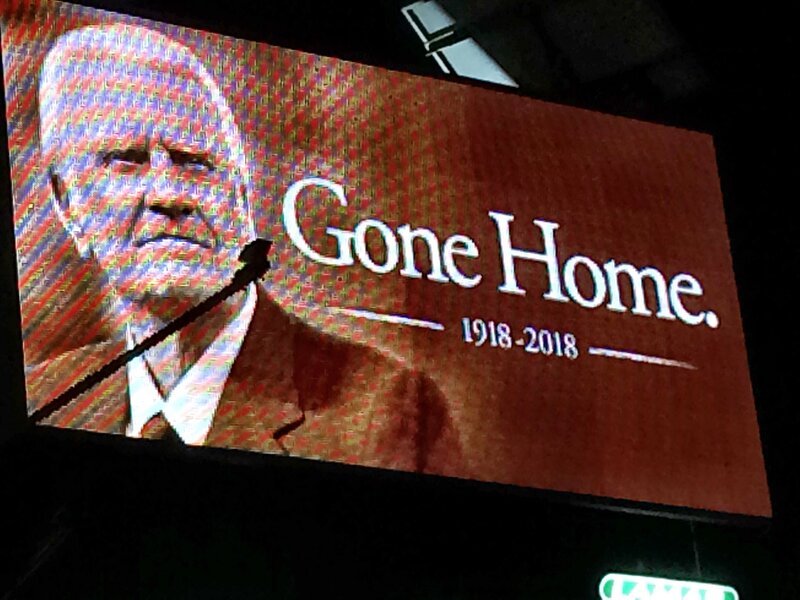 Just the other day I saw this picture, a billboard remembrance of Billy Graham, posted in a Tweet. “Gone home” brought back memories of the spurious teaching and preaching I have been under for many years regarding the end of one’s life. If we say “home is where the heart is” then yes, Billy Graham went home. If we say Heaven is our final destination, as I have heard so often in sermons and songs then no, Billy Graham did not go home. Am I being picayune? I will tell you why I do not think so. Like with the constant preaching of “ministry, ministry, ministry”, so much of my life in attendance in a Bible church setting has been under the preaching and teaching that someday we will all be taken up and away from this ‘God-forsaken’ mess. We will either be ‘raptured’ or die. Either way, as the sermon goes, we will be taken up to our final resting place in heaven. As far as I am concerned that preaching is dead wrong for at least a couple of reasons. First, the “rapture” is a fantasy imposed onto Scripture. We should see the Scripture in the context it was written and not add fantasy notions to it. The Apostle Paul, by the Holy Spirit, gave us the imagery of Christ returning in power. In 1 Thessalonians 4.15-16 the Apostle “Paul is casting a vision of Christ’s return wrapped in political overturns (he actually does this a lot!)”. There will be no “rapture”. “The Late Great Planet Earth” and the “Left Behind” series of ‘end times’ books are also fantasies imposed on Scripture. These books are not worth your time. Second, when we die we do go to heaven – the place where Jesus is. And where Jesus goes, we go too. He will be returning to the worlds that are created for him. You see, “heaven” is just a way station, an intermediate stopping place. Heaven can be thought of as a station set between principal stations on a line of travel. Think railroad. Heaven is not our final destination. Heaven is a way station along the way. As such, heaven is not a retirement community, as has been implied by so much preaching and teaching and by popular songs and hymnody. I remember singing “This world is not my home I’m just a passing through” and wondering, “Is that all there is? If we’re just passing through what was the point of all this? Is heaven some hyper-imaginary place where I put my feet up after a life of work? There are many more escapist songs just like “This World…”. I remember singing “When we all get to heaven…” and “I’ll fly away” and “When the roll is called up yonder, I’ll be there”. Now, why would God create a new heaven and a new earth if “heaven” was your final destination? “Then I saw a new heaven and a new earth. The first heaven and the first earth had passed away, and there was no longer any sea. And I saw the holy city, the new Jerusalem, coming down out of heaven, from God, prepared like a bride dressed up for her husband. I heard a voice from the throne, and this is what it said: “Look! God has come to dwell with humans! He will dwell with them, and they will be his people, and God himself will be with them and will be their God. He will wipe away every tear from their eyes. There will be no more death or mourning or weeping or pain anymore, since the fist things have passed away. Compare Genesis 1 and 2 and Revelation 21 and 22. Creation was meant to be a place where God dwells with his creation. Creation is the temple designed by God where He is to dwell among his people. Consider the Garden of Eden, Consider the tabernacle, the Temple, and now the indwelling of the Holy Spirit in us who are the temple of the Holy Spirit. Consider the new heavens and new earth where God dwells with his people. The work of Jesus on the cross is a work of creation’s redemption, of restoring Genesis in Revelation. The life of Jesus and his death on the cross is for the reunification of heaven and earth. You and I, after passing through the way station of heaven will return and take up roles in the new created order. The reason I write this post is to get instill the reader with spiritual momentum that will push one past the grave and past the “final resting place” thinking and towards the dynamic of the Kingdom of God on earth. With your death you are not being put out to pasture. Rather, you are being resurrected and repurposed to do the work of the Kingdom of God on earth where God will dwell with you. Lay up for yourselves those ‘retirement fund’ thoughts now.